Ph.D., University of Arizona, 1990. Bacteriophage, or phage, are the viruses of bacteria. I am interested especially in phage adaptation: How phages can and have optimized their characteristics toward meeting the challenges of growth and survival. My research consists of a combination of theoretical and empirical analyses of phage population growth, and structure, as it occurs within both broth and semi-solid environments. My overall goal is to develop a more-complete theoretical understanding of the constraints acting on phage evolution. Calendar, R., Abedon, S.T. (eds) (in press). The Bacteriophages . Second Edition. Abedon, S.T. (in press). Phage ecology. The Bacteriophages . Second Edition. Abedon, S.T., Culler, R.R. (2007). Bacteriophage Evolution Given Spatial Constraint. Journal of Theoretical Biology, in press. Abedon, S.T. (2006). Phage Ecology. In R. Calendar & S.T. Abedon (eds): The Bacteriophages Edition 2, Oxford University Press, pp. 37-46. Abedon, S.T., LeJeune, J.T. (2005). Why Bacteriophage Encode Exotoxins and Other Virulence Factors. Evolutionary Bioinformatics Online 1:97-110. Breitbart, M., Rohwer, F., Abedon, S.T. (2005). 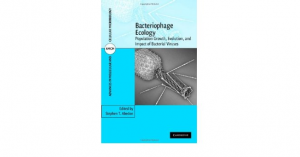 Phage Ecology and Bacterial Pathogenesis. In M.K. Waldor, D.I. Friedman, & S.L. Adhya (eds): Phages: Their Role in Bacterial Pathogenesis and Biotechnology, ASM Press, Washington, DC, pp. 66-91. LeJeune J.T, Abedon, S.T., Takemura, K., Christie, N.P. and Sreevatsan, Human S. (2004). Escherichia coliO157:H7-Genetic marker in isolates of bovine origin. Emerging Infect. Dis. 10:1482-1485.